ANKARA, Turkey (AP) — Ignoring widespread criticism, Turkish President Recep Tayyip Erdogan on Tuesday again showed excerpts of a video taken by the attacker who killed 50 people in mosques in New Zealand, to denounce what he called rising hatred and prejudice against Islam. The comments drew a strong protest from Australian Prime Minister Scott Morrison, who called in Turkey’s ambassador and demanded they be withdrawn. His government issued a travel advisory warning people visiting Canakkale for the anniversary to exercise caution. Morrison said “all options are on the table” if Erdogan does not withdraw his comments. Turkish ambassador Korhan Karakoc said he had a “frank” conversation with Morrison when the envoy was summoned to Parliament House on Wednesday. Hundreds of New Zealanders and Australians travel to Canakkale each year for Anzac Day on April 25, to mark the start of the battle of Gallipoli and to commemorate the dead. “Remarks have been made by the Turkish President Erdogan that I consider highly offensive to Australians and highly reckless in this very sensitive environment,” Morrison told reporters in Canberra, Australia’s capital. “They are offensive because they insult the memory of our Anzacs and they violate the pledge that is etched in the stone at Gallipoli,” he said, referring to a promise made by the founder of modern Turkey, Kemal Ataturk, that those who are buried rest on friendly soil. “I do not accept the excuses that have been offered for those comments,” Morrison said. 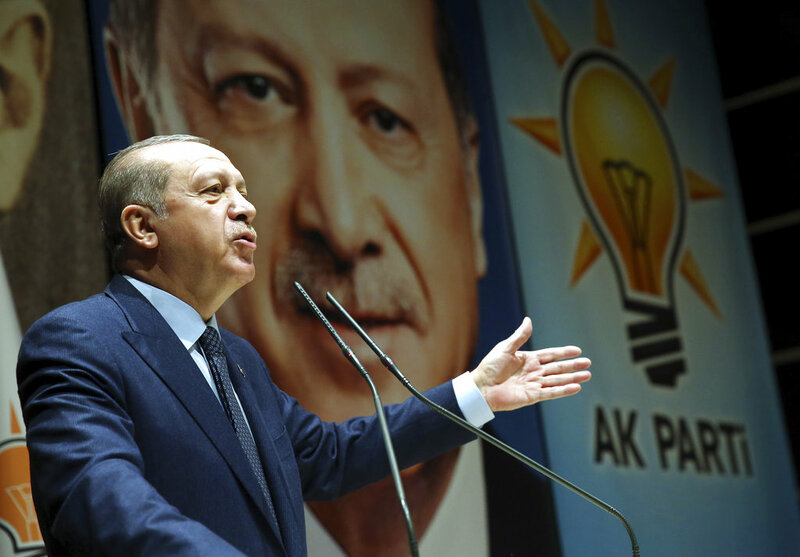 Since the weekend, the Turkish leader has been using clips of the Christchurch attack to denounce Islamophobia during campaign rallies, as he tries to stoke nationalist and religious sentiments ahead of March 31 local elections. The video, which was blurred but had clear sounds of automatic gunfire, has been shown to thousands of people at the rallies and aired live on Turkish television, despite efforts by New Zealand to halt its spread. The video prompted widespread condemnation. Facebook said it removed 1.5 million versions of the video in the first 24 hours after Friday’s attack. Turkey’s main opposition party has also criticized Erdogan for showing the clip “for the sake of (winning) three or five votes” in the elections. New Zealand Foreign Minister Winston Peters said Monday that he told his Turkish counterpart the video doesn’t represent New Zealand. Peters is due in Turkey later this week to attend a meeting of the Organization of Islamic Cooperation in Istanbul as an observer. The New Zealand Embassy in Ankara also said Peters had raised the issue with a Turkish delegation in New Zealand. It said the embassy in Ankara and other embassies worldwide had requested that media outlets not show the footage.